How can we develop perspectives which enable people to work freely in a mutually-oriented way, and which allow them to negotiate their interests successfully? This is a central question for me, both in my professional and private life, and in social, cultural and (occasionally) political commitments. During my social work studies, I mainly dealt with neighbourhood processes. My internship as a community organizer in Chicago was a very formative experience for me. In addition to the calm activity of establishing contacts and exchanging information about neighbourhood issues, public events made a lasting impression on me, such as demonstrations for a humane minimum wage for public contracts (something which is increasingly gaining recognition in Germany as well). I have been a member of the SOCIUS team since 2003. Here too, I encounter issues of communication forms and spaces in which individuals can express their needs, wishes and interests, and then negotiate them with other parties. The most interesting processes to me are those in which the results are truly open. I consider it important that such negotiations are conducted as respectfully as possible, that the participants feel recognised,and that the final outcomes of negotiations can be expressed – also in an external form. I am currently involved in participation processes at a municipal level, OE processes at regional and federal levels, and team development. 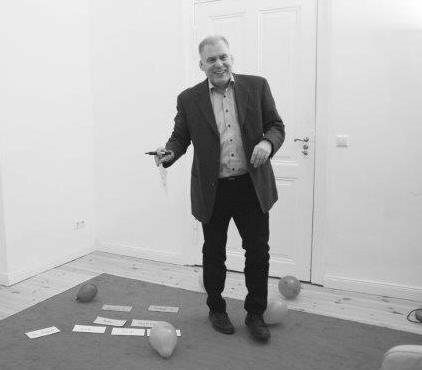 Since 2015, I have been continuing my professional education at an intersection of Gestalt, complex processes and systemic approaches on a two and a half year course of studies in London. This ‘new lens’ strongly characterises my work at present and I plan to integrate this even further in the future. I enjoy traveling and working internationally. Following my six-month stay in Chicago, I spent a year with DED (German international development organisation, now called GiZ) in Mali after completing my studies. I am currently running a participation project with 15 local communities in Tunisia; I often travel there and am learning at least as much as the project participants. I am a voluntary board member at UNITE!, a credit cooperative which aims to develop and support economic perspectives for and with its members. I was born in 1975 near Kassel, Germany. I enjoyed a rather ‘classical education’ and this is a thread which still runs through my life: I love my weekly choir sessions with the Marienkantorei in Berlin, reading beautiful books, and going to the theatre and concerts.